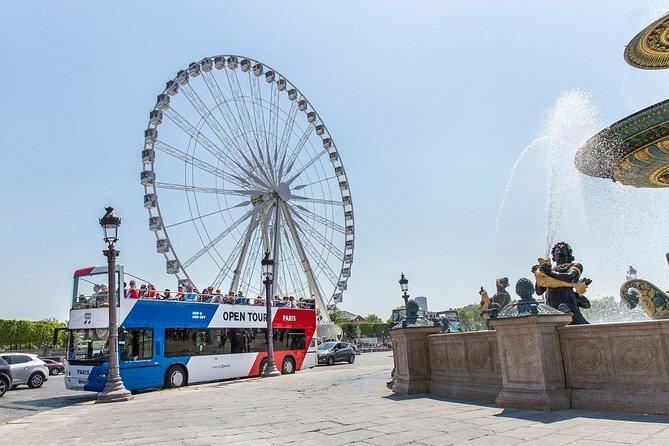 Explore Paris at your own pace by both land and water with this combination hop-on hop-off bus and boat tour. You can travel to major attractions like the Eiffel Tower and Notre-Dame Cathedral on an open-top bus and on a Seine riverboat, making up your own sightseeing itinerary. As you ride along four different bus routes with 35 stops, listen to commentary about the sights of Paris. Then hop on the water to make use of nine stops on the Seine near landmarks like Musée d'Orsay. When booking, choose either a 2-day or 3-day pass. - Complete Operator information, including local telephone numbers at your destination, are included on your Confirmation Voucher. Our Product Managers select only the most experienced and reliable operators in each destination, removing the guesswork for you, and ensuring your peace of mind. Book a 2- or 3-day hop-on hop-off tour in Paris to see the city’s famous sights at your own pace. With access to both land and water routes, you’ll have double the enjoyment as you travel around the City of Lights. The hop-on hop-off tour by open-top bus includes 3 interconnected routes that provide convenient transportation across the city; see the Itinerary section below for the list of stops. Hop off whenever you wish to visit attractions at your leisure, and when you’re on the bus, listen to recorded commentary about Paris via personal earphones. Perhaps visit museums like the Louvre, historical landmarks like Notre-Dame or architectural icons like the Eiffel Tower. Relax at Luxembourg Gardens (Jardin du Luxembourg), ride the Montmartre funicular or explore popular quarters like the Marais and St-Germain-des-Prés. When you’re ready to see the city from a different perspective, head to the river for the hop-on hop-off boat cruise along the Seine. Nine stops give you access to locations like Musée d'Orsay, home to a large collection of Impressionist art, and Hotel de Ville, the city hall. You can ride the buses and the riverboat as much as you want for the duration of your selected pass. Start your tour at any of the bus stops. Blue Line From stop 1 April to October: Every 8 minutes from 9.30am to 9.30pm. Last departure: 8pm November to March: Every 15 minutes from 9:30am to 7:45pm. Wonderful way to see the city. The boat tour was a nice chas nge from sitting on a bus all the time. Loved the experience! Definitely the way to see Paris, but don't rely on the from the bus drivers. One of our drivers had no idea where the dock was for the river boat excursion which is included with the ticket. We used the Paris Hop-On Hop-Off sightseeing bus for two days and found it a good and inexpensive way to get around to many of the sites in the city. Unfortunately we did not use the Seine River Cruise part of this tour because it was pretty cold and a little rainy on the days we could have and we just ran out of time. We found the bus pretty convenient and easy to use. It was nice sitting on the top deck, as far as being able to see a lot, but again, the cold and somewhat rainy days made that uncomfortable at times. Great way to see all the top sights comfortably.